Howdy all! After a couple of years of reading all about Zoe’s me-made/self-stitched challenges, I finally had just about enough to participate this time! I pledged to wear at least one home-made garment each day. Day 1 – Sewaholic Crescent Skirt. This is my most recent make and I love it. I am wearing it here with the Shoes of Glory. 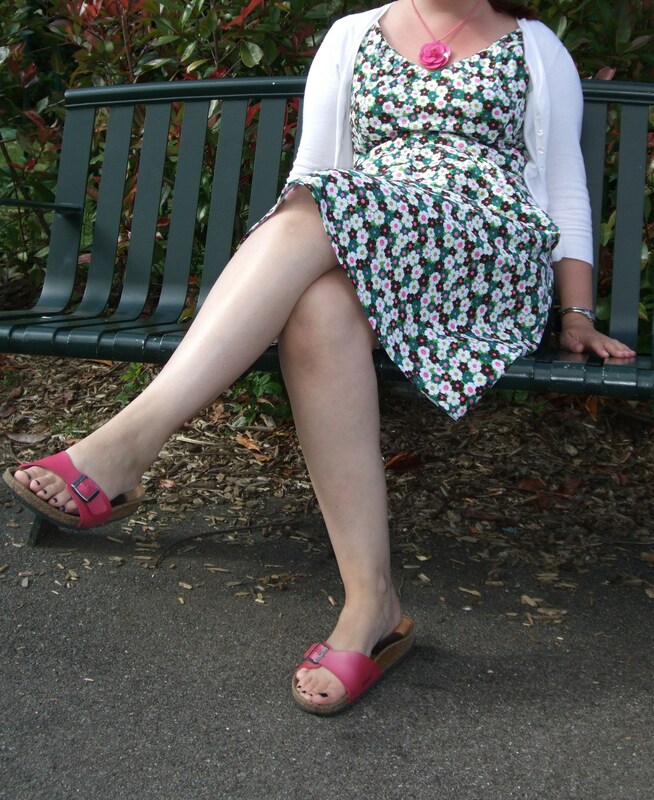 Day 2 – Colette Parfait Dress. It was quite a chilly day so here’s my Parfait all wintered-up with black tights, a cardi and Irregular Choice Flick Flacks. Day 3 – Simplicity K2938. This is the crumpled look after spending around three hours driving! I’ve worn this top loads, it’s comfortable and it goes with all my jeans, so, win! Here it is with my cropped jeans and pearly pink Birkenstocks. Day 4 – New Look 6789 in green and purple floral print. This is a halter-neck dress and felt perfect for a hot day at the beach! Day 5 – New Look 6789 in Alexander Henry Pin-Up Cowgirls fabric. This is one of my oldest home-made dresses but one of my favourites. It’s a very silly print and has totally unecessary ribbon trim but I love it. I’m wearing it with a brown cardi and brown cowboy boots as it was a cool day. I even wore my hair in pigtails to add to the silliness but you can’t see that here as I’ve cropped the photo! Day 6 – Burda 7798. I needed to wear something comfortable today and practical for wandering round on a day out so this was a good choice with jeans and flat shoes. 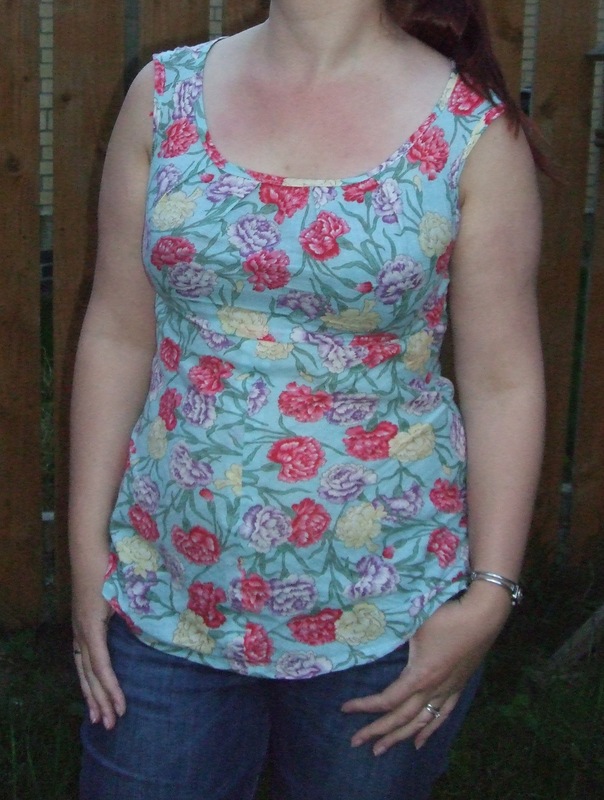 Day 7 – Simplicity 2591 in Michael Miller Marcia fabric. This dress is really comfortable (can you tell how important that is to me?!). 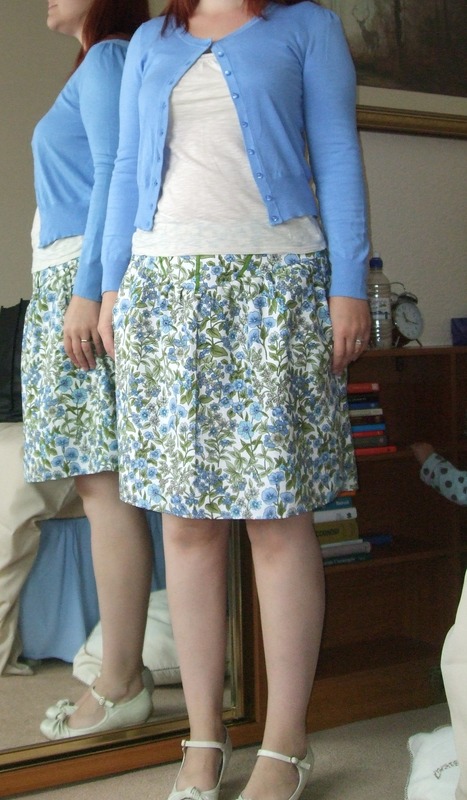 I wore it with a ridiculously large pink plastic necklace, a white cardigan and my pink Birkenstocks again. I do have some gorgeous green heels which go really well with this dress, but I was working in a reception class today so I had to consider practicality! And that’s it so far. I’ve got a few more unworn me-made items to wear but I think to get through the month I’ll have to wear each thing a couple of times. I’ll try to wear them in different ways or with different shoes though! Ooh fun! I love all your me mades and I especially love all your shoe pairings! Ah thanks! Shoes are a very important part of the outfit I think! !